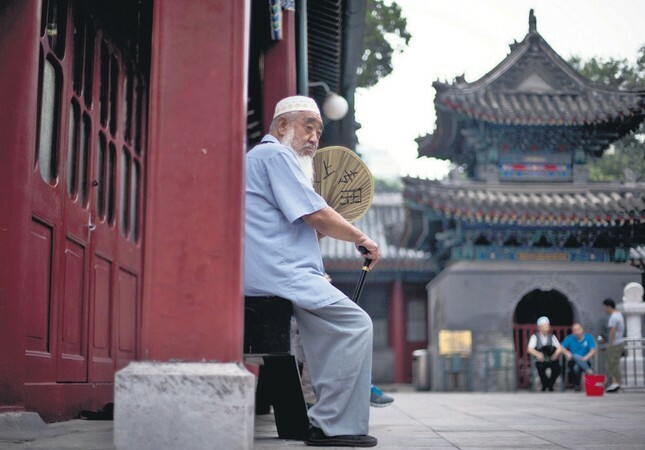 A Muslim man fans himself as he waits for the time to break his fast during the Muslim holy month of Ramadan at the Niujie mosque, the oldest and largest mosque in Beijing, China, July 2, 2014. Turkey's foreign policy was mainly security-centric during the Cold War years, acting as a buffer zone between the Soviets and Europe. Therefore, many Turks perceived communism as "evil." Additionally, China was also deemed to be among these "communist evils." Relations between Turkey and China officially began in 1971, with a rapprochement in the American-Sino relationship being the main reason. This relationship paved the way for Turkey to look beyond its borders toward communist China for economic and political gains. There had been ups and downs in Turkish-Chinese relations from 1971 to 2002, with neither political nor economic relations seeing any improvement during this period. It should be noted that there were initiatives, mutual visits; however, both sides did not get what they wanted from one another. The conflicting agendas of both countries could be considered the main reason that trust between Turkey and China had been eroding. Since 2002, economic relations between Ankara and Beijing have improved year by year with the total trade volume exceeding over $25 billion in 2017. Turkish exports to China were around $3 billion while imports from China amounted to around $24 billion in 2017. China became Turkey's main trading partner in terms of imports, and the first trade partner in East Asia. On the political side, Turkey and China have seen noteworthy improvements since 2002. Mutual visits by Turkish and Chinese leaders occupied the front pages of many newspapers with President Recep Tayyip Erdoğan visiting China in 2015, 2016 and 2017. Many agreements over the last decade, ranging from economic to strategic issues, were signed between Ankara and Beijing. Both new and old mechanisms have been activated to strengthen Turkish-Sino relations; one such example being the Turkish-Chinese Business Council which was first established in 1992. During the meeting of the Turkish-Chinese Business Council in 2015, President Erdoğan and Chinese President Xi Jinping were among the participants. This showed that both countries' leaders give great importance to each other. However, there is an issue that erupts on every occasion between Turkey and China. In order to accomplish a very beneficial and wholehearted mutual relationship between the two countries, this issue needs to be solved. The Uighur issue is a long-standing issue between Turkey and China. If there is no permanent solution to the issues with the Uighurs, there will be constant hindrance in reaching full political, economic and sociocultural relations between Turkey and China. In the last decade, Turkey and China achieved tremendous improvements in relations. However, the Uighur problem suddenly erupted and caused short-term tensions between Ankara and Beijing in 2009. The Turkish Prime Minister, Recep Tayyip Erdoğan, criticized China harshly over the incidents in Urumqi in 2009. Therefore, this is one issue that should not be sidelined by the two sides. First of all, the rights of the Uighurs need to be based on the framework of the international principles of human rights. This is what Turkey rightfully asks China – to improve the conditions of the Uighurs in China since they have religious, linguistic and ethnic affiliations with the Turkish people. News about the bad conditions faced by Uighurs in China are well-known worldwide through international news agencies. Such news may affect Turkish-Chinese ties and disturb the Turkish public. The world is wary in regards to the events in the Uighur Autonomous region or East Turkestan with the Chinese policies, such as camps and dispatching Chinese people into Uighur homes. On the other hand, Turkey respects the "One China Policy" and thus understands that the Uighur issue is a domestic one. However, despite the Uighurs being citizens of China, they are not ethnically Chinese. Uighurs share more commonality in religion, belief, language and race with the Turkic world than with Chinese society. It could be said that the Uighurs are relatives of Turkic societies across Central Asia. China should stop presenting all Uighurs as terrorists. China should guarantee the protection of Uighurs' rights, show the world that the Chinese regime has no issues with its minorities, their races and beliefs. In this way, I'm sure that people across the world and in Turkey will see China in a more positive light. There should be more cooperation between Turkey and China on the Uighur issue if both sides genuinely want a better, well-founded and lengthy friendship in the coming years. China, as an evolving economic giant, and Turkey as a leading country in the Muslim world, should work together on this issue. While Turkey understands China is a sovereign nation, China should not ignore Turkey's advice when it comes to the Uighur issue. China should support the presence of Uighurs in the Uighur Autonomous Region rather than attempting to indoctrinate them. China should let the Uighurs live the way they want to rather than putting them in inhumane camps called "educational or vocational" camps. This is not an acceptable form of education for any human being. China should accept Uighurs as they are, thus showing to the world the true Chinese civilization that most people and I admire. Talks over the Uighur issue between Turkey and China will not stop nor destroy the relationship between China and Turkey. In fact, being honest and having direct talks between Turkey and China on this issue will benefit both sides and encourage a mutual understanding of both civilizations. Firstly, it will help China alleviate tensions related to the Uighurs in China, including in the Uighur Autonomous Region. It will integrate Uighurs into Chinese society willingly. Direct talks will bring harmony and peace between Uighurs and the Chinese people. Secondly, Turkey will benefit more from Chinese innovations, technology and investments by hosting more Chinese visitors. The perception of China in Turkey will evolve from negative to positive, which will in turn help build a strong friendship between Turkish and Chinese societies through the Uighurs. Thirdly, it will also have a positive impact on Turkic and Muslim societies from Kazakhstan, Uzbekistan to Turkey, Pakistan, Azerbaijan and Malaysia, all of which are very important components of China's Belt and Road Project. Uighurs will be a bridge not only between Turkey and China, but throughout the Turkic and Muslim world.